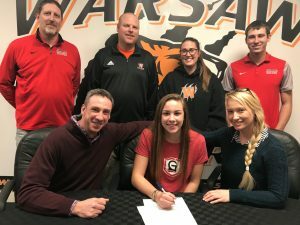 Warsaw Community High School sprinter and hurldler Michaela Buriff has chosen her future lane and signed a letter of intent to continue her athletic and academic path at Grace College, once she wraps up her final season with the Lady Tiger Track & Field program this spring. Buriff has been a part of three Northern Lakes Conference, Sectional and Regional championship experiences, and the two-time 300 regional hurdle qualifier hopes to help the program continue its dominance this spring. Buriff has not only been setting the pace for clearing hurdles on the track, she has been an exceptional leader and setting the mark in the school and community. The scholar athlete volunteers every Sunday at church working with elementary students, and she is currently working at the WMCA as a swim instructor. Buriff also serves as a summer camp church counselor for 5th and 6th graders, lifeguards at Winona Lake in the summer, and volunteers with the Tim Tebow Foundation’s Night To Shine for special needs. Looking to major in elementary education at Grace, Buriff will join coach Jeff Raymond’s Lancers on the track. Grace is a member of the NAIA, NCCAA, and the Crossroads League. Pictured (L-R): Jeff Buriff, Michaela Buriff, Cherish Buriff; Back Row: Jeff Raymond (Grace College Track & Field Head Coach), Jeff Hamstra (WCHS Athletics), Megan Davis (WCHS Track & Field Coach), Max Kittle (Grace College Track & Field Assistant).